Kannada, Telugu and Tamil were used in their respective regions of the empire. Over 7000 inscriptions including 300 copper plate insriptions have been discovered, in Kannada,Telugu, Tamil and Sanskrit. Gold, silver and copper were used to issue coins. The coins contained the images of Venkateshwara the sin destroyer, Goddesses, divine couples and animals such as bulls, elephants and birds. 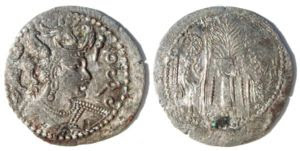 The earliest coins feature Hanuman (monkey god) and Garuda (vehicle of Lord Vishnu). Kannada and Telugu inscriptions have been deciphered and recorded by historians of the Archeological Survey of India.